When we are in the coldest period of the year with bitter wind chills and bone freezing temperatures it is often difficult to see the silver lining in the clouds of winter. Shovelling the snow from our walkways and driveways and dealing with boots covered in dirty slush are now a daily inconvenience not to mention the temperature necessitates extra layers of sweaters, hats and mittens and taking walks and venturing outside become a less inviting activity. While we may not have the record snowfalls as in areas of New York and previously in Colorado we still take our share of abuse with the Canadian Winter bringing her annual dose of misery to us. 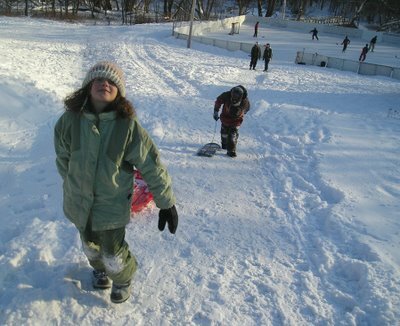 Knowlton is lucky to have great outdoor skating rinks, one behind the Knowlton Academy and one right downtown in the main park beside the Cold Brook. The hill behind Knowlton Academy is the perfect place for families to gather and do their toboggoning and play some hockey. Weekends often see dozens of kids with their tubes and crazy-carpets zooming down the hill. Luckily it is within walking distance for most residents and what better way to spend time with friends and family and keep warm through good wholesome exercise. The cold weather does tend to make life's simple pleasure even more enjoyable; a crackling fire in the fireplace is something magical at this time of year and a glass of red wine can warm us up with a sweet tenderness that is extra delicious this time of year. Valentine's day gives us a chance to have a much needed "holiday" after the Christmas' denouement. What can warm us up more than celebrating our love for one another and Valentines day is a chance for us to be reminded that we cannot take anything for granted especially our family, friends and loved ones. The period around Valentines day is a traditional day on which lovers express their love for each other. We give flowers and chocolates and help our kids make cut-out paper hearts for their friends at school and it is a perfect time to make a donation to a local charity. While handmade cards have largely given way to mass-produced greeting cards and now more and more people are sending ecards via email it is still a handmade gift or a small heartfelt token of appreciation that means the most to those closest to us. The Greeting Card Association based in the United States estimates that nearly one billion store-bought paper valentines are sent each year around the world, making the day the second largest card-sending holiday of the year behind Christmas. The association also reported that women purchase approximately 85 percent of all valentines. While giving chocolates and jewels to the "better half" is a traditional priority this lover's holiday is an even better time to reflect on our responsibilities and priorities and to take a few moments to go over our own personal rules of engagement in our lives. While retailers are encouraging us to by gifts, toys, cards and candies we should not forget that Valentine's day should be about celebrating and showing appreciation for the human bond we have with those close to us. But, as we are often reminded, there is nothing wrong with giving a store bought token of appreciation shaped like a heart especially if it is pure dark chocolate! 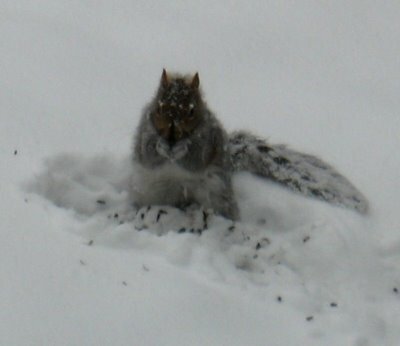 To all creatures great and small...have a happy Valentines Day...even you pesky squirrels!